Shark Simulator 2018 lets you roam around in the beach and play as a mighty shark. In the start of each level, you will be given a task to complete. Make sure it is finished before you run out of time or your level will be failed. Missions may include collecting stars, hunting down, fishes etc, hunting and attacking other sharks items into the game. Use the on screen navigation keys to move left and right, passing through the way point to collect target in the game. Watch out for the underwater divers or the hunters, they are equipped with guns to attack you. Avoid being detected by them and complete you mission as fast as possible. Now control the sharks that are rushing from meal to meal, terrorizes the waters, go on a frantic ocean rampage, and come back with a full stomach. Attack them when they are unaware so that you guarantee a kill. Explore a beautiful aquatic world and evolve iconic sharks like the Great White and Megalodon! 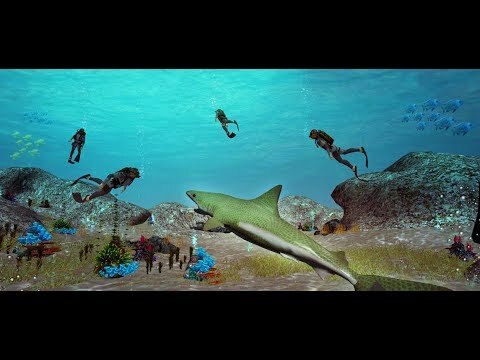 * Awesome sea creature sim. * Real life underwater exploring experience.